McConnell Honda in Montgomery, Alabama is proud to announce that the 2012 Honda Fit, the winner of Cars.com’s $16,000 Subcompact Shootout. The Cars.com shootout put seven of the most popular subcompacts through head-to-head testing by the experts at Cars.com, Motorweek and USA Today. The competition also included an evaluation by a young married couple, representing the typical buyer in this segment, to test the subcompacts for overall comfort and drivability. The 2012 Honda Fit took the title because of overall roominess for its size, practicality and for being fun to drive. View full coverage of the results here and make sure to pick up a copy of today’s USA Today to see the front page coverage of our shootout. With rising gas prices, fuel efficient vehicles like subcompacts play a significant role in today’s market. Winning an award from Cars.com sends a message to your customers about the quality of the Honda Fit. Sharing this news in your dealership, on your social networks and in planned marketing materials is a great way to spread the news to potential customers. 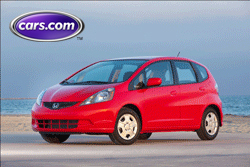 Come test drive a Honda Fit in Montgomery, Alabama today or visit us on the web.